The deals are so great you will want to be first line line. Sign up to be a consignor to get access to our presale. 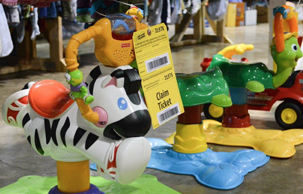 A bargain hunter's dream - everything you need for the kids - all in one place! You can save on average 50-90% off of retail. You'll find aisles of the best in gently-loved and new items at great savings! There is even a great selection of toys and children gear. No need to deal with going to the bank and carrying around abunch of cash or going hunting for that seldomly used checkbook. We accept major credit/debit cards making checking out just that much easier.